Grand Rapids history is a long one, people-wise starting a couple thousand years ago. In the 1850's it started to become 'furniture city' due to it's production of furniture, something that it still does to one extent or another today. The Grand Rapids Museum has a Thank You Beer, exhibit this month and next. 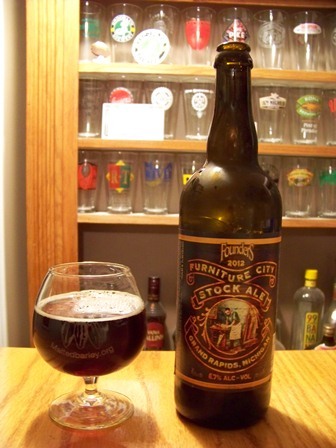 In honor of this, and Grand Rapids rich history, Founders produced furniture city ale. The profits are going toward the museum. On to the beer. It's a brown, and it has that poopy malt that some folks insist on putting in browns. I am not a fan of poopy malt (for those amharets of beer, poopy malt is a highly technical term only used by highly snobby and distinguished beer geeks to refer to a very particular malt that you probably are unable to understand). This beer is dominated by the roasted tobacco flavor of the 'poopy malt'. Overall it is a very good brown, if you like the 'poopy malt' style of brown. Personally I prefer something like Lagunitas WTF which is in my opinion the finest brown on the face of the planet. Ok so all the 'poopy malt' bashing aside. This ale pours a rich brown with minimal head, rich slightly roasted malt tones dominate the aroma. It possesses a medium body, the same malt aspects that are in the aroma manifest in the flavor with just a tiny bit of tannin bite (very minimal just the perfect amount) coming through. Hops are present but barley detectable - as they should be in a brown ale. Overall an excellent brown, but there are certain malts that I am not a fan of. I like porters that are rich and sweet, not the roasted smokey malt kind. The same with browns. I am just not a big roasted malt fan, in moderation it's ok, but any beer dominated by roasted malt is just not my thing. I am sure that for anyone who likes browns and roasted malt, this ale would be in your top five. But alas I will go back to my syrupy sweet brews that taste of ketchup (another very technical beer flavor terminology). This page contains a single entry by Brewmaster published on November 18, 2012 3:58 PM. Wish List was the previous entry in this blog. Michigan Winter Brewfest Tickets for 2013 is the next entry in this blog.